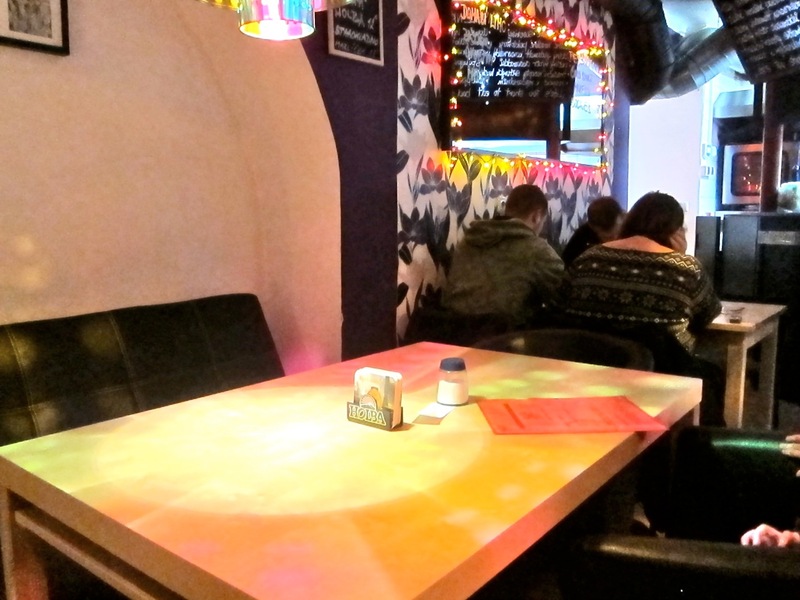 There's a Tex-Mex and burger joint that's been getting a lot of attention from the Czech press. 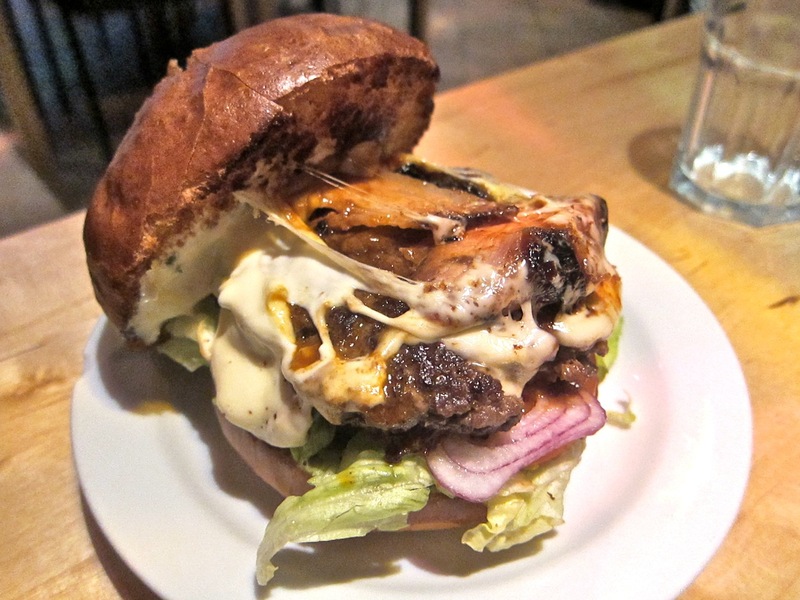 This country's top food blogger, Pan Cuketka, said he had the best burger of the year there last summer. The American owner, Scott Van Wagenen of New York, was interviewed by one of the biggest newspapers. The other top Czech paper gave the food top marks. A major Czech news magazine raved about the "fantastic burgers." 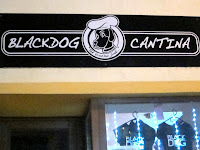 Yet, little to nothing has been written in English about Blackdog Cantina. 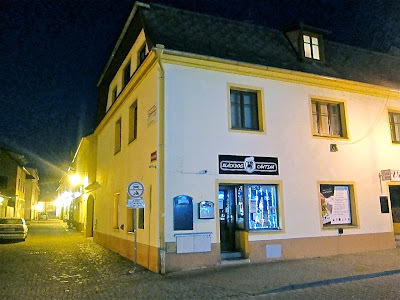 One reason could be that it is in Beroun, about 40 kilometers from the center of Prague. Undeterred by distance, I had to see what all the fuss was about. I'd been looking for a chance to drop in for more than half a year. A return from an Italian road trip finally gave it to me. It was good I had my GPS with me. The device quickly helped me find the little corner the restaurant sits on. The restaurant is tiny. 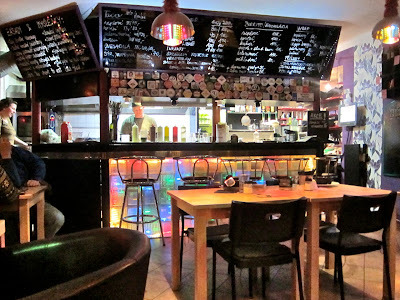 There's an open kitchen and bar with a few stools in front of it. There are about five or six tables. That's it. In the summer, there are more, with outside seating. I reserved a table at 6 p.m. on a Saturday night. The waitress on the phone said she didn't think it was necessary. Thirty minutes after we arrived, they were turning people away. We started with drinks. My Czech friend had the house red (45 CZK). She said it was quite nice for the price. I ordered the homemade ginger lemonade (20 CZK). It had a pleasant ginger zing, but was otherwise too watery for me. I thought it needed a shot of lemon or sugar or both. My friend got a small order of beef nachos (small 105 CZK/large 170 CZK). The small order is plenty large for one person. The star here is the beef. It was slow-cooked to a tender state and marinated in adobo seasoning. It had a subtle but unique flavor and aroma that I've never found anywhere else in this country. 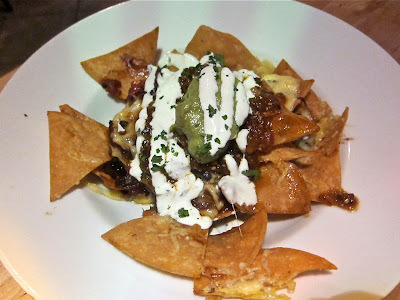 The beef rests underneath black beans, melted cheese, guacamole and sour cream. It sits on top excellent warm corn tortilla chips that keep a lot of their integrity under the heavy ingredients. We both loved it. I wanted to get a chipotle pork taco, but the pork was unavailable this night. Instead, I tried the lime and coriander marinated chicken taco (50 CZK or two for 75 CZK). The pulled chicken had the light flavor of lime, though it was a little salty for me. They spice some dishes to order, and this one had mild heat, as requested. 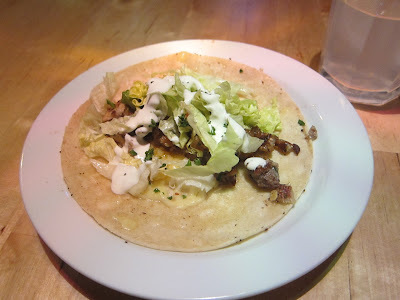 Also in the warm, soft corn tortilla were cheese, lettuce, salsa, a dab of guacamole, and sour cream. For a second round, I couldn't resist the Infarkt Burger (140 gram burger for 110 CZK or 200 gram version for 135 CZK). I got the large. I don't believe in half measures when it comes to heart attacks or burgers. 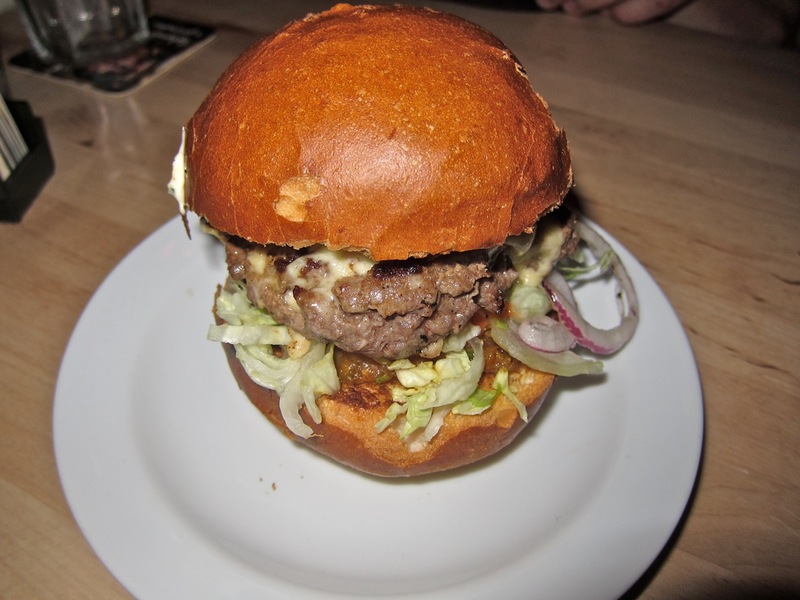 It comes on a lightly sweet, soft, but deceptively sturdy brioche-style bun. Equal in excellence was the high-quality ground beef. The thick patty had great flavor. Also included were guacamole, soft, smoky bacon, melted cheese, red onion, lettuce, tomato, and seasoned mayo. The menu said it had ancho chili, but I didn't really taste it. The one disappointment here was that the menu also said burgers are cooked medium unless otherwise requested. Mine was cooked all the way through, with not a bit of pinkness to be seen. Aside from that, I'd rate it among the top burgers in the country. Finally, I finished with the chocolate death (65 CZK). 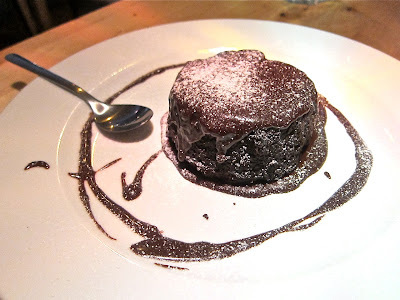 This cake, served warm, was similar to a fondant, but without the liquid center. Instead, the chocolate sauce -- real, high-quality stuff -- was poured over the top. A great ending. The bill for this meal was a modest 445 CZK. I was impressed enough that I had to make the 45 minute drive to try more. I returned the following week with my Italian friend and another couple. The ladies had the house wine. Big B and I had the amber Birell (30 CZK each). 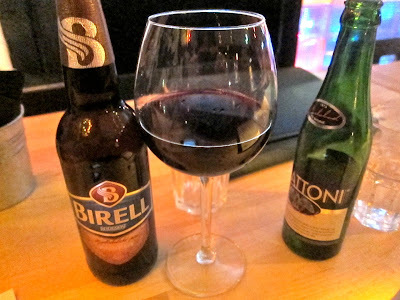 I really don't like non-alcoholic beer, but this one was drinkable. Big B liked it a lot. 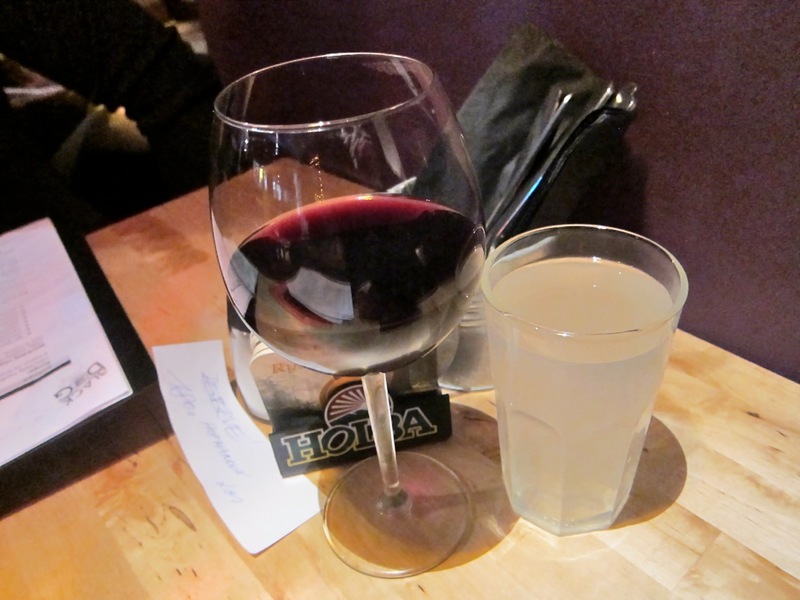 We also had Mattoni mineral water (25 CZK). Some of us ordered a couple of things, thinking it would come in two rounds, but it all came at the same time in a Tex-Mex avalanche. I wanted to try the black bean and sweet potato empanadas (75 CZK), but those were not available this time. Instead, I got two tacos with the same filling (75 CZK). They had different types of salsa. I didn't really pick up the flavor or texture of the sweet potato. But I really like black beans and the warm corn tacos shells are great. It's a nice vegetarian option. Big B got the large Lucha Libre Burger (130 CZK). 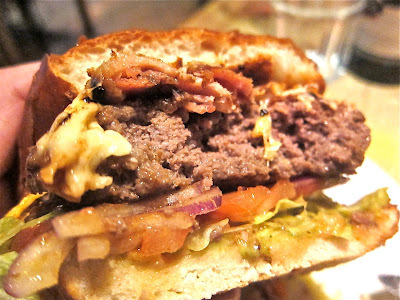 This one includes bacon, lettuce, tomato, cheese, grilled onions, and salsa. He declared the bun "very nice" and he loved the grilled onions. His was cooked medium-well, definitely more than medium. He said he would certainly return for another one. Big B was also pleased with the low price for such a high-quality burger. 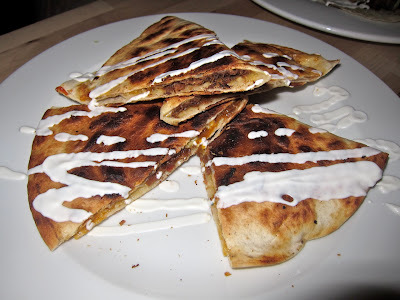 My Italian friend had the grilled vegetable quesadilla (60 CZK). This was a bit of a let down. It was dark, but the only vegetable we could see or taste inside was grilled onion. The grilled onions were done well, but it was too simple. 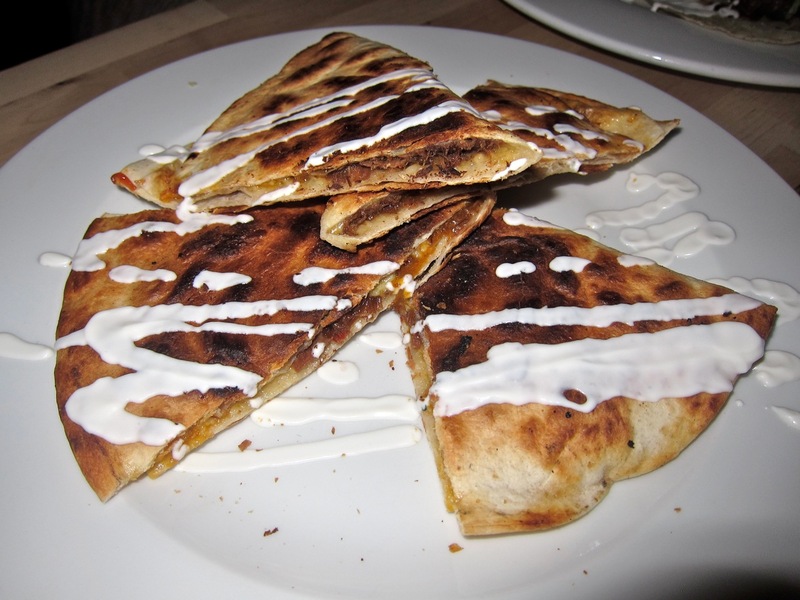 A bigger let down was M's beef quesadilla (70 CZK). 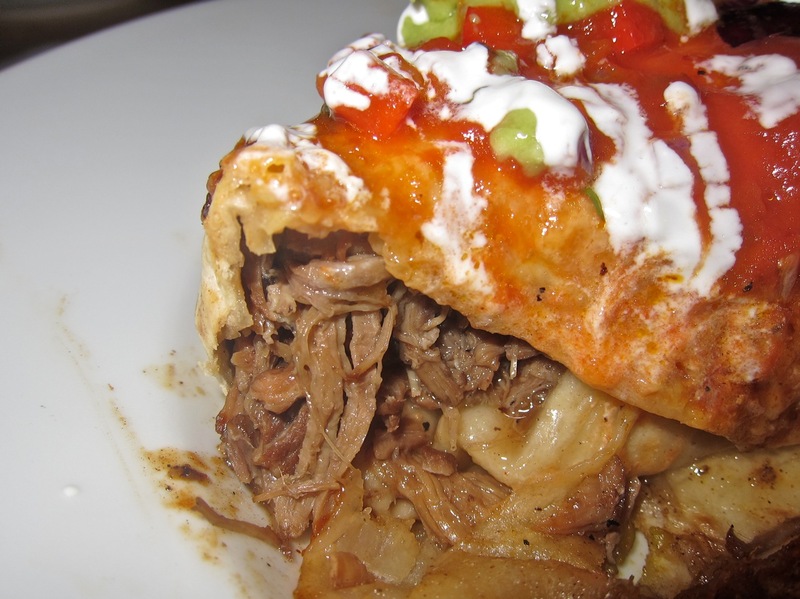 They were filled with cheese and the adobo beef, which was as good as the first visit. 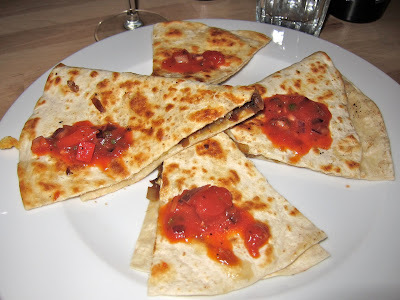 But the tortillas were on the grill too long and had a burnt taste. We decided not to send them back, but it really took the pleasure out of them. Finally, I had the chipotle pork enchilada (115 CZK). 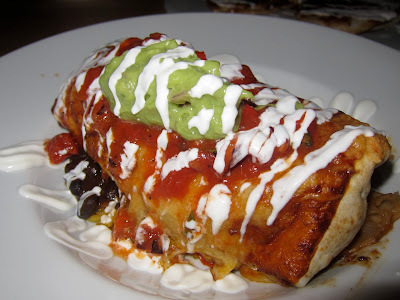 The baked flour tortilla sat on black beans and rice and was coated with salsa, guacamole and sour cream. It was big. Inside, there was slow-cooked pulled pork. There was a lot of it. The meat was tender, with a hint of the chipotle. I wished for more. The pork had a sweetness that might surprise some people, but I was fine with it. My friend didn't think I could eat it all, but I finished every bite. This second evening was marred by the table next to us. It was occupied by six roaring, shrieking drunks. They were mainly partaking in the Holba beer on offer, along with various shots. It was hard to cope with in such close quarters. 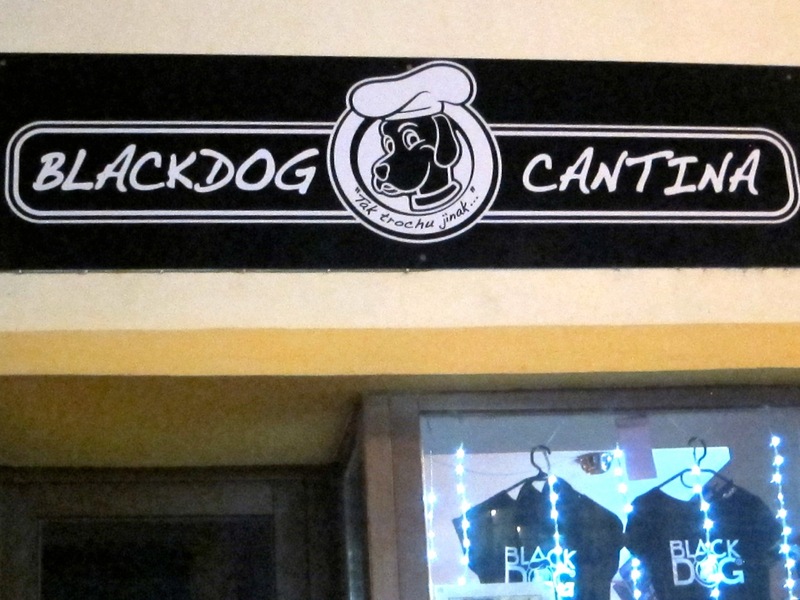 Blackdog Cantina is not perfect. The overdone burger and quesadilla attest to the occasional lack of focus. The owner was cooking on both nights. There are also reports on the Czech site, Scuk, about issues with service. But I will also say that there is nothing else like it in this country. Who else is doing Tex-Mex quite like this? 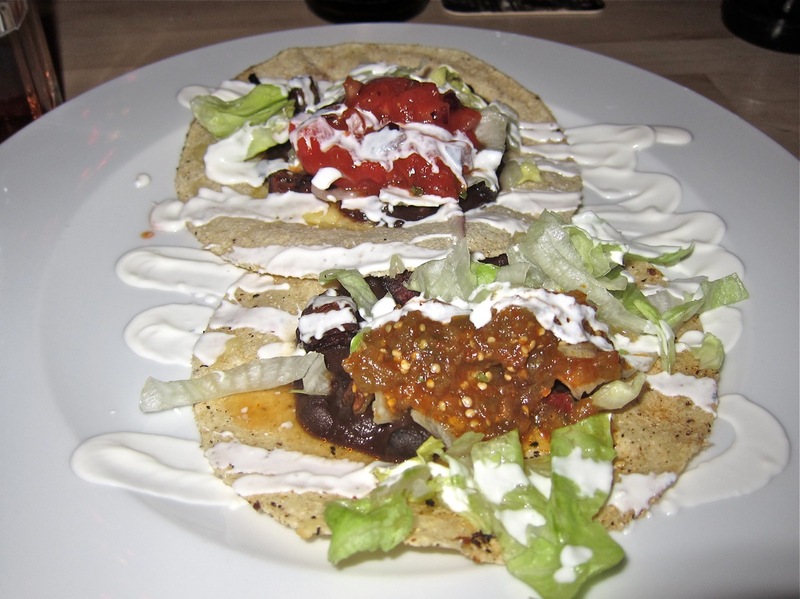 The tacos rival those at Las Adelitas, the only authentic Mexican restaurant in the Czech Republic. And on top of that, the burgers are great.. I don't know if I'd make a special trip again. However, the next time I'm heading toward Plzen, I'll certainly stop in Beroun and have a burger and adobo beef nachos. The Blackdog is not quite heaven, but it's enough close to the border. Great blog. Just moved to Prague and I can't wait to try out your recommendations!